The spot, also called "spot fish" or "Norfolk spot" is one of the most popular saltwater fish of the Mid Atlantic. Spot are abundant in North Carolina, Virginia, and Maryland, and occur farther north in lesser numbers. These small members of the croaker family are named because of the prominent black spot that appears behind their gill flap. Although accomplished bait stealers, spot can be caught in good numbers by using the correct baits and rigs. 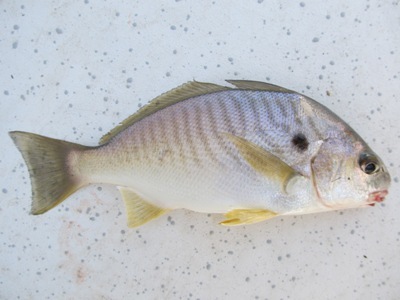 Spot are caught near fishing piers, jetties, inlets, the surf, oyster beds, and other areas. Popular baits for catching spot fish include bloodworms, squid, shrimp, peeler crab, sea clams, and other baits. Anglers also report good success using special scent impregnated baits such as Fishbites bait strips. Although spot rarely exceed 10 inches in length, they make excellent table fare. Their small size and abundance also makes them very popular as live baits. Spot are especially sought after as bait for striped bass, bluefish, trout, red drum, cobia, king mackerel, sharks, and other gamefish.